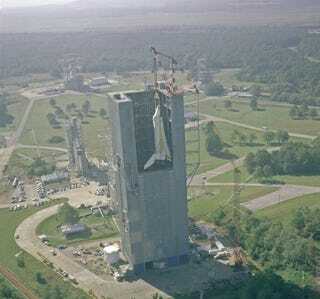 An aerial view of Shuttle Orbiter Enterprise being hoisted into Marshall’s Dynamic Test Stand for the Mated Vertical Ground Vibration test (MVGVT). The test on October 4, 1978 marked the first time ever that the entire Space Shuttle elements—an Orbiter, an External Tank (ET), and two Solid Rocket Boosters (SRB)—were mated together. The purpose of the vibration tests was to verify that the Space Shuttle performed its launch configuration as predicted.